Contracting officers request a Preaward Audit in order to understand the accounting system which is being used by a government contractor. Many government contractors are stupefied to find out that their accounting system isnâ€™t adequate, even if the books are being meticulously kept. The SF 1408 evaluation checklist gives a detailed list of what DCAA auditors are looking for in an accounting system. However, this is not the only system used to determine whether a contractorâ€™s accounting system is adequate. The DCAA auditor must determine whether the accounting system will be able to give reasonable information in terms of cost projection for the completion of the project. Potential government contractors should be aware that their present accounting system is taken into use. However, it is acceptable to DCAA to plan for the use of a different accounting system if the contract is awarded. This is because DCAA realizes that the contractorsâ€™ current projects might not require such a detailed accounting system as a government project. In this case, the contractor must be able to show in the Preaward Audit that the accounting plan is operable. That means that it can quickly be put into use and that the employees are capable of using it. Unless you are hiring outside help for the DCAA Preaward Audit, it is recommended that you simplify the requirements by already having the accounting system planned for use during the DCAA contract in use. If the accounting system used by the contractor is not DCAA satisfactory, DCAA will notify the contractor as well as the procurement official. 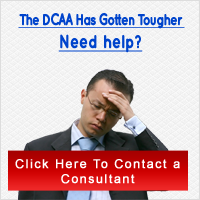 While DCAA often will recommend how to correct any deficiencies with the accounting system, it is up to the contractor to fix the problems and come up with a new accounting system. A new Preaward Audit can be requested once these deficiencies have been corrected. In some situations, a DCAA Preaward Audit is not done of the accounting system. However, an audit of the accounting system can still be performed even after the contract has been awarded. Also, even if you pass a DCAA Preaward Audit and are granted a government contract, always be prepared for additional auditing at any time. The DCAA auditor may decide to initiate another audit if he/she decides that additional auditing is necessary to make sure the contract is being fulfilled.